The popular screenshot tool Skitch is launching on the iPhone today and Evernote, which bought the tool about a year ago, also just released version 2.0 for Mac and iPad. With this update, Skitch is also paring down Skitch’s smart but idiosyncratic user interface down to its bare minimum, leaving a lot of functionality that the application’s users always loved behind in the process. 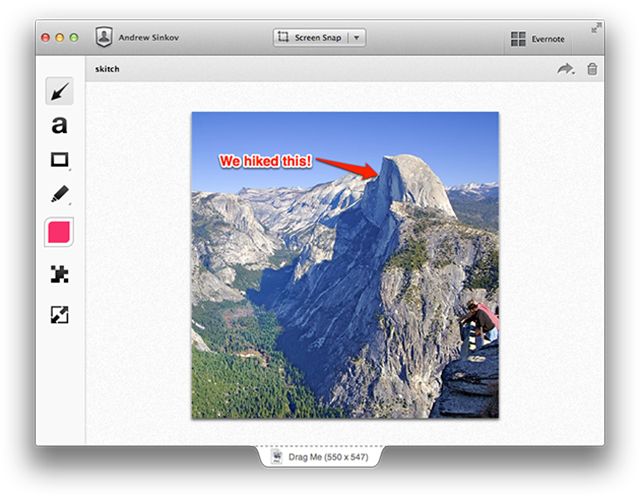 Skitch used to be the best screenshot tool for the Mac. Those days are now over. The new version of Skitch for the Mac, says the Skitch team, “embodies the application’s purpose of helping you communicate your ideas quickly and easily.” Sadly, in the course of this mission to simplify things, too many useful features got left at the drawing table. Gone is the ability to resize images by just grabbing the corners of the window, for example. Gone, too, is the ability to minimize the app to the menu bar. Nor can you choose the file format for your screenshots anymore (it’s .png or nothing), and the magnifying glass that lets you make sure your screenshots were pixel-perfect while you were taking them is gone, too. In return, the app is now very deeply integrated into the Evernote ecosystem. Thankfully, you can opt out of registering for an Evernote account and use the app without syncing with Evernote. Not all is bad, though. The application now features a tool for pixelating parts of an image, and the new highlighter tool will also be useful for some. If you really love Skitch 1.0, however, your best option right now is to just skip this update (and hope that Evernote will bring some of the old app’s features back) or look into alternatives like TechSmith’s Snagit (which is sadly a bit costly). The new Skitch on OSX is crap!